Manila, Philippines – Led by “Truth in Focus” hosted by Bro. Eli Soriano, four (4) other television programming produced by the Members Church of God International (MCGI) aiming to spread God’s words and charity, received Anak TV seals of approval on February 23, 2016. 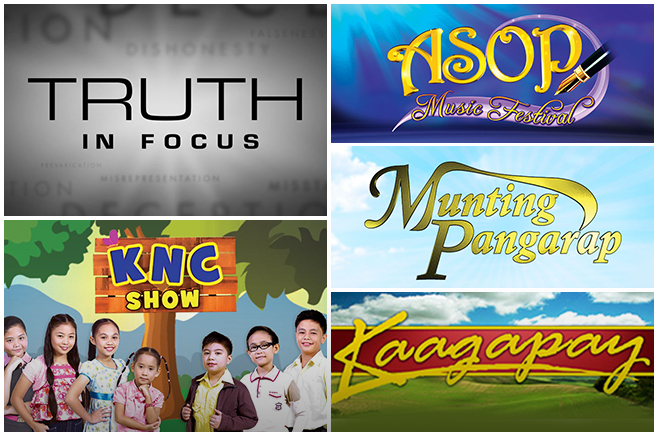 The five MCGI-produced TV shows that received the Anak TV Seal of Approval on February 23, 2016. Award-winning praise song competition “A Song of Praise” (ASOP), charitable program for the marginalized sector of society “Munting Pangarap” (Small Wish), as well as public service show “Kaagapay” each take home an Anak TV seal award. Anak TV also gave its stamp of approval to Philippine television’s “Bible school on air,” the KNC Show. Receiving the awards for the said shows, Kaagapay host Ms. Annie Rentoy spoke about Kuya Daniel Razon, the UNTV-BMPI Chairman and CEO, for coming up with these original programming on UNTV. “Truth In Focus” is MCGI Overall Servant Bro. Eli Soriano’s English-format expository program about God’s truth written in the Holy Scriptures. 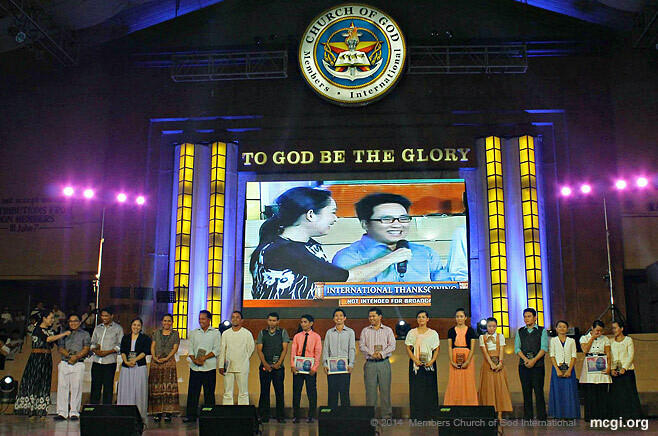 This is the seventh consecutive time that MCGI shows received recognition from the Anak TV Foundation. These MCGI programs are being aired on UNTV Life UHF Channel 37, together with other shows such as Bread N’ Butter, Cook Eat Right, Doctors on TV, Easy Lang ‘Yan, Frontliners, Justice on Air, Quick Action Team, Rise N’ Shine, Rotary In Action, and Spotlight, which also receive seals of approval from the Anak TV foundation. The youth-oriented program “Klasrum,” which aims to equip teens with a useful and fun guide to help them with different life situations which range from academics to social responsibility, also received an Anak TV seal of approval. “We thank God for all the opportunities that He gives us. It’s our first year [on air], yet [the Anak TV foundation] already gave us this award and recognized our efforts. Thank you so much, Anak TV and Kuya Daniel,” remarked Klasrum host Joshua Dionisio. Bro. Eliseo Soriano, Overall Servant of the Members Church of God International (MCGI), called for more compositions in different languages and dialects in future A Song of Praise Music Festivals (ASOP). “May what is in the Bible happen wherein all tongues, cities, and nations praise Him,” remarked Bro. Eli during the ASOP Year-End Finals 5774 on April 24, 2015. MCGI follows the Hebrew Calendar observed by the Lord Jesus Christ and His Apostles. Bro. Soriano encouraged composers to write in a variety of language and dialect. He and Bro. Daniel Razon understand a number of Philippine southern dialects and foreign languages like Portuguese and Spanish. Bro. Eli and Bro. 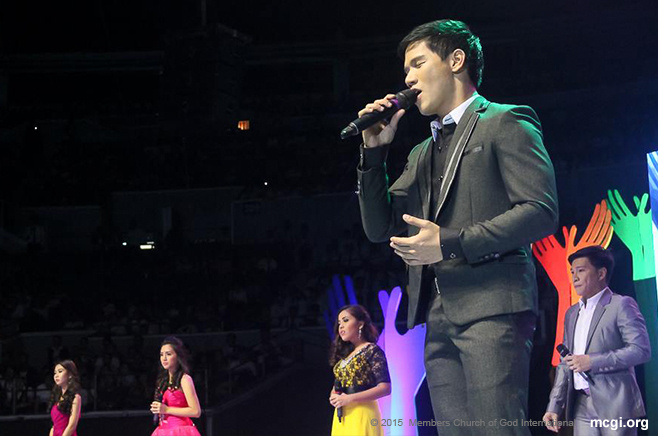 Daniel serve as judges during ASOP Finals. The MCGI Overall Servants give their comments after each song is presented. In previous ASOP festivals, a song entry from Brazil titled, “Tua Palavra” (Your Word) won 3rd place in 2010, while “Ipasigarbo Ko” (I Will Boast Of) from Visayas got 3rd place in 2011. “Salamat Sa Iyo Amang Banal”, penned by Bro. 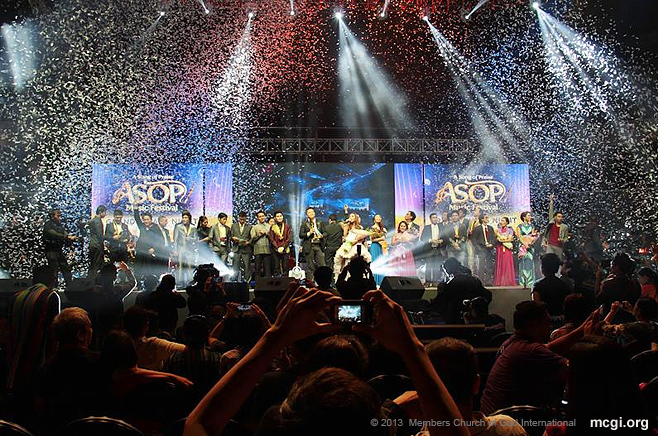 Cris Ayuban representing the Luzon Region, Philippines, claimed the Song of the Year-End 5774 title in the last ASOP finals. A total of 14 entries came from different Church Divisions, most of which were in Filipino and English. Bro. Daniel advised congregants who wish to join the bi-annual event to review the comments of Bro. Eli in past ASOP festivals first. “If we will listen to those comments, to the pointers that Bro. Eli gives — and we would then listen to the songs we wrote — more or less, we will understand how it should be done,” stated Kuya Daniel. The singer-songwriter noted that though there are different ways to craft songs (e.g. melody first, lyrics later and vice versa or simultaneously done), there must still be room for adjustments. Bro. Razon added that one major comment he and Bro. Eli give during ASOP is about how songwriters should avoid superfluity in a song’s lyrics, which makes it not jive well with the melody. Bro. Soriano reiterated the value of the consolidated efforts of composers, lyricists and the screening committees of each Church Division in improving their respective song entries. The Old Path host also reminded songwriters to read the Book of Psalms, and to devote quality time in making songs for the Almighty. For the full list of winners, please see here. 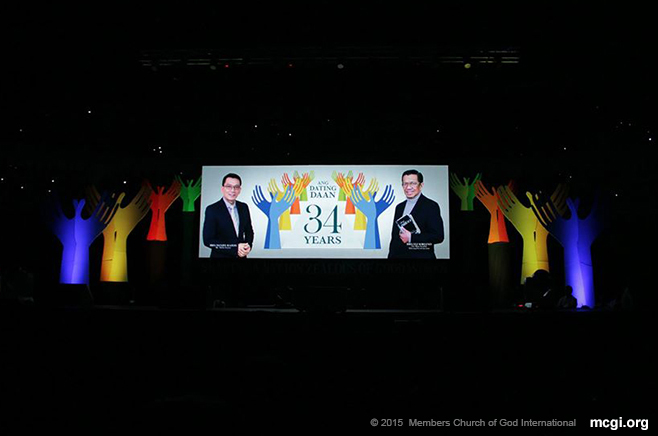 From The Old Path’s 34th anniversary to citations in the Philippines and Brazil, the Members Church of God International (MCGI) left the last quarter of 2014 with much to remember by. Marking the 34th year of its flagship program Ang Dating Daan (The Old Path), MCGI held a month-long celebration of good works. MCGI congregants in different parts of the globe lead public service endeavors like cleanup drives and medical missions. This is apart from the Church’s day-to-day humanitarian activities. Members in New York launched a clean-up drive in the city’s Belvedere Park. Liberians welcomed patients of MCGI’s free clinic there, while Ghanan members attended to the refugees in its charity home. In the Philippines similar services took place like the medical missions in Cavite and Bicol provinces, which benefitted about 5,000 indigents. 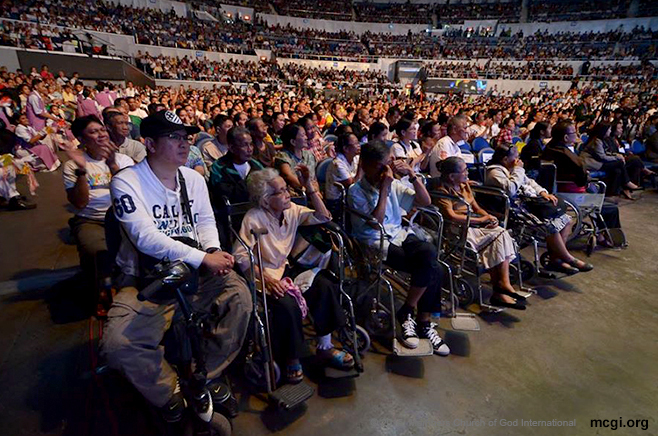 MCGI topped of its celebration of good works with a Worldwide Bible Exposition on October 30, 2014 that once again challenged The Big Dome’s 20,000-plus seating limits. 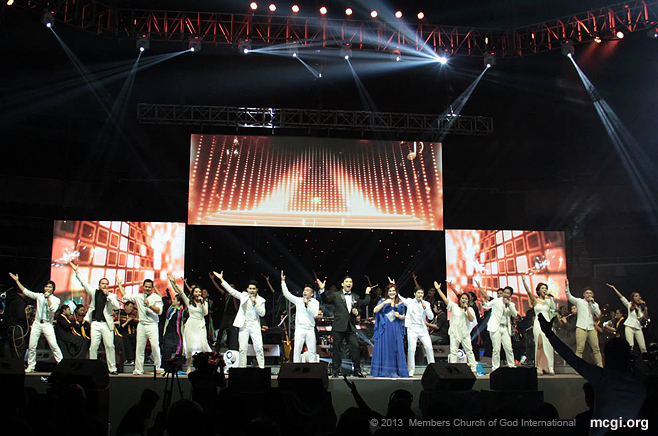 A Song of Praise (ASOP) interpreters like Frenchy Dy, Gerald Santos and Beverly Caimen to name a few, welcomed the massive crowd with a slew of winning songs from the Philippines’ first-ever Gospel songwriting tilt on television. Bro. Daniel Razon then delivered a keynote speech on the worldwide reach of The Old Path in its 34 years of programming before giving the floor to Bro. Eli Soriano. Soon afterwards, Itanong Mo Kay Soriano, Biblia Ang Sasagot (The Bible Will Answer. Ask Bro. Eli), the trademark question-and-answer segment of the program, took off. Guests at the coliseum and from more than 1,360 remote points across the globe asked their questions of faith live to the MCGI Overall Servants. In the same month, MCGI together with media partner UNTV, received a citation from the Philippine Embassy in Brazil for their extensive aid to their fellow Filipinos and Brazilenos. “MCGI or The Old Path is of great help to the embassy because of your widespread outreach to this place, which is seldom reached by our people,” expressed Philippine Ambassador to Brazil Eva G. Betita to an MCGI representative. The attaché added that with the aid of UNTV, the country’s consular services in the region reaches as many people as possible. The year saw many succesful Filipino registrants for the upcoming national elections, one of the joint efforts of the embassy and UNTV. The MCGI brethren in Brazil on the other hand have been recognized for their public services to their fellow Brasileiros. Like their Filipino counterparts, Brazilian members are active in donating blood and in caring for the elderly. For donating over 10,750 blood bags in 2014 alone, MCGI received the Jose Rizal Award from the Department of Health for the third consecutive year. Philippine Blood Disease and Transfusion Center OIC and Executive Director Dr. Ma. Victoria Abesamis told that MCGI’s efforts are “unceasing”. MCGI conducts blood drives quarterly every year as part of its commitment to saving lives. The first ever news-and-rescue team in the Philippines was conceptualized and formed by BMPI Chairman and CEO Kuya Daniel in 2010. BMPI, which stands for Breakthrough and Milestones Productions International (BMPI), is content provider of The Public Service Channel UNTV. Marking his 31st birthday in the spirit on November 28, 2014, Bro. 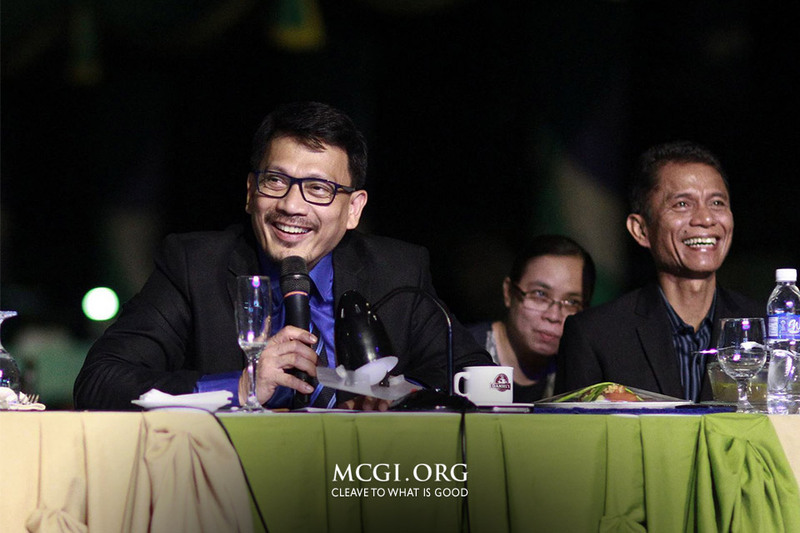 Daniel held a dinner concert for charity three days earlier to help further MCGI and UNTV’s various public services. Bro. Daniel sang standards together with Bro. Eli Soriano via live video streaming in a concert aptly called “Double” at the Manila Hotel. MCGI Overall Servants spearhead the funding of many humanitarian endeavors that the organization has launched in the country and abroad. Doing good to all regardless of race or religion is part of MCGI doctrine (Gal. 6:10). 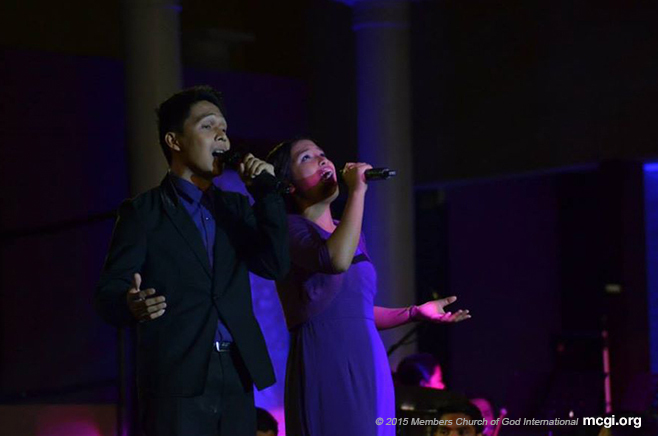 A powerful ballad about trusting God’s mercy during trying times, May Awa ang Dios (God’s Mercy) bested 11 other finalists to claim the Song of the Year title in the A Song of Praise Music Festival Year 3 Grand Finals on September 23 this year. Louise Lyle Robles, an amateur composer, took home the P500,000 prize, tax free during the culmination of the year-long songwriting competition on UNTV. “Firstly, I thank God because He willed for me to have a part in the good advocacy of this program, ASOP TV,” said Robles in an interview during a press conference before the finals night at the Smart-Araneta Coliseum. World Championship of the Performing Arts (WCOPA) Champion Beverly Caimen interpreted the winning song. Caimen was chosen as the night’s Best Interpreter, and received a 50,000-peso prize. First-runner up was Sa Bawa’t Araw (In Every Day) by Marlon Nabia. The song tells about appreciating everyday’s blessings and was performed by Shanne Velasco. Joining his brother among the winner’s ranks was Meldin Nabia, who bagged the third-runner up position with his world music piece titled Biyaya (Grace) sung by Bayang Barrios. Arniel Villagonza’s Tanging Gabay (Special Guide), on the the other hand, took second place. A piece about reformation through God’s guidance, Tanging Gabay was interpreted by popular singer-actress Rachel Alejandro. Hangga’t May Tinig Ako (As Long As I Have My Voice) written by Jinnie Adilan of Cavite was hailed as the People’s Choice which was decided through text voting. 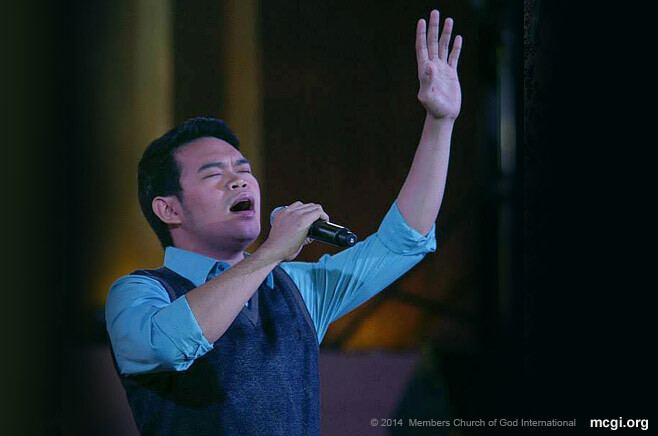 Voices of 5 member Darryl Ong lent his voice for the R & B song of praise. Among the judges for the night were musical director and arranger, Danny Tan (Iisa Pa Lamang, composer), and singer Wency Cornejo (Next In Line, Hanggang), who said that they were honored to be a part of the event. Dr. Mon Del Rosario, resident judge of ASOP TV, said that judging the songs was very difficult as all are equally potent for the win, and the night could be anyone’s ballgame. On her ASOP TV experience, Robles said that it is one of the best she has had. “Apart from meeting celebrities, the most important part is that I’m able to let my song entry be heard by countless people,” she added. ASOP TV was conceptualized by Bro. Eliseo Soriano and Bro. Daniel Razon. ASOP started as an event of the Members Church of God International (MCGI) in 2004, and was launched as a TV program in September, 2011. The contest is open to all amateur and professional songwriters in the Philippines and abroad. This year’s entries were not only written by amateur and professional composers, but also by popular Filipino artists. Tulak ng Bibig, Kabig ng Dibdib singer Lilet Esteban wrote You Are Lord of All, which was interpreted by Freestyle’s Ava Olivia Santos. Actor-director Cesar Montano composed Pagpupuring Walang Hanggan (Eternal Praise), sung by Orange and Lemons’ Mcoy Fundales. Other grand finalists were Ralph Lauren Refil’s Ikaw Ang Tangi Kong Minamahal (You’re the Only One I Love), interpreted by Papaya singer Gale Blanco; Oliver Narag’s Kislap (Shimmer), interpreted by ASOP Year 1 grand finalist Jessa Mae Gabon; Hesus, Aking Musika composer Ricardo Sanchez’s God Will Win Our Fight, interpreted by former IAxe Band vocal Jek Manuel and Sta. Maria Band lead vocal Jayson Fernandez; Jesse Bayodoc’s Panginoon Kay Buti Mo (Lord, How Good You Are), interpreted by Voices of 5 member Walton Zerrudo; Empol Balbin’s Awit ng Puso Ko (My Heart’s Song), interpreted by Bo Cerrudo, who was included in the Manila run of Miss Saigon and other plays as well. For non-winning participants, ASOP awarded each with a P20,000 consolation prize. Manila, Philippines – Twelve new praise songs will serenade Filipino audiences and will compete against each other for the much-awaited A Song Of Praise (ASOP) TV Music Festival Grand Finals Night on September 23, 2014 at the Smart-Araneta Coliseum. Ralph Lauren Refil is the composer of “Ikaw ang Tangi Kong Minamahal,” a powerful ballad that tells a person’s love for his Creator will be sung by Gail Blanco. Jesse Bayodoc, a masseuse from Laguna proves that visual impairment is not hindrance to writing musical compositions, nor in expressing gratefulness to God with “Panginoon Kay Buti Mo.” Bayodoc’s masterpiece will be interpreted by Pinoy Idol 2008 finalist, Walton Zerrudo. “Awit ng Puso Ko,” penned by Empol Balbin will be interpreted by classical balladeer Bo Cerrudo. Louise Lyle Robles’s “May Awa ang Dios,” a song treading along the lines of soap opera music tells about trusting the mercy of God during trying times, will be sung by WCOPA Grand Champion Performer Ms. Beverly Caimen will perform Roble’s grand finals entry. “Biyaya,” a world music genre piece written by Meldin Nabia, will be performed by Bayang Barrios, one of the Philippines’ renowned ethnic folk singers. Arniel Villagonza’s “Tanging Gabay,” which also makes the list, will be interpreted by popular singer and actress Ms. Rachel Alejandro. “Kislap’s” upbeat tune was inspired by Oliver Narag’s daughter Tala. The song will be interpreted by Ms. Jessa Mae Gabon. Two alternative pop rock icons in the Philippines, Jek Manuel and Jayson Fernandez, will interpret “God Will Win Our Fight,” a piece crafted by professional praise songwriter, Mr. Ricardo Sanchez. Movie and television actor and director Mr. Cesar Montano joins the ASOP composers’ roster with his composition titled “Pagpupuring Walang Hanggan,” to be performed by Kenyo vocalist Mcoy Fundales. Marlon Nabia’s “Sa Bawat Araw,” song entry will be interpreted by UNTV’s Klasrum host Shanne Velasco. Freestyle vocalist Ms. Ava Olivia Santos will sing “You Are Lord of All,” a composition by 80’s star Ms. Ma. Luzlilet “Lilet” Esteban. Rounding up the 12 finalists is Jinnie Adilan’s “Hangga’t May Tinig Ako.” Adilan’s R&B piece will be performed by PHILPOP 2014 2nd runner up Mr. Daryl Ong. The ASOP Music Festival is the first-ever musical competition on television that promotes the creation of songs of praise to God. Each year, songs or praises that make the finals showcase different musical varieties, such as ballad, novelty, alternative pop rock, and even ethnic. The TV songs of praise writing competition first opened its doors to breakthrough praise song compositions in 2011, featuring amateur and professional songwriters and interpreters. Twelve monthly winners compete for the championship trophy each year. Aside from the grand prize, song entries are eligible to win the People’s Choice Award. ASOP TV viewers may vote for their favorite compositions by texting its corresponding vote code. Complete information can be viewed on ASOP Music Festival’s official website www.asoptv.com. A Song Of Praise Music Festival is the only songwriting TV program in the Philippines, hosted by Mr. Richard Reynoso and Ms. Toni Rose Gayda. ASOP TV airs on Sundays at 7 pm on UNTV. 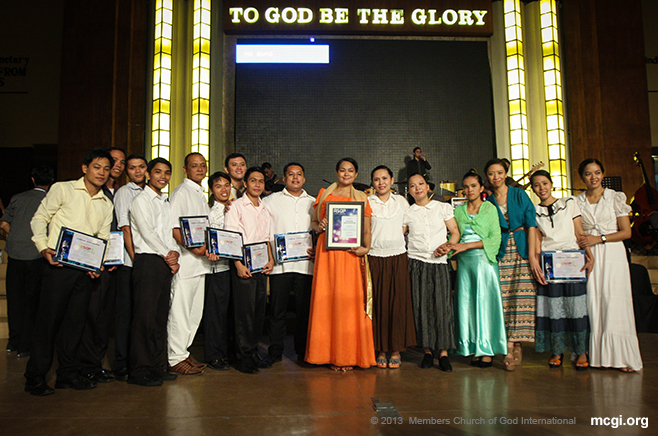 All thirteen finalists of the A Song of Praise Music Festival shared the “Song of the Year” award, a historic awarding in this bi-annual Members Church of God International (MCGI) songwriting competition. Bro. Eliseo F. Soriano broke the “big news” during a regular Thanksgiving service on April 19 this year, two weeks after the songwriting festival was held on April 6, the second day of the International Thanksgiving to God (ITG). Although not unusual that two or three winners share the grand prize, declaring all finalists winners surprised everyone. It was a move that was made so much special because the Presiding Minister celebrated his baptism jubilee on April 7 this year. Organizers said that over half-million cash prizes will be split to all winning composers, lyricists, and interpreters. The Philippines was represented by finalists from the regions of Cavite, Laguna, Batangas, Mindoro and Romblon (LBMR), Central Visayas, and Mindanao. Cavite Division was the first to perform with “Mula ng Makilala Ka,” (Since I Met You), an original composition by Bro. Juanito Pascual and interpreted by Bro. Reynan Nueva. “Dakilang Pagmamahal” (Great Love), a composition by Bro. Empol Balbin, represented LBMR Division. The song titled, “We Sing You Praises”, composed and interpreted by Sis. Naomi Sorianosos with Sis. Jenny Gonzales, represented the Central Visayas region. Rounding up the four songs hailing from the Philippines is “Sana ay Pakinggan” (Please Hear Me) from Mindanao Division’s Bro. James Almaden and performed by Sis.Nicole Ann Villagonzalo. Mongolia’s entry entitled “Budhing Walang Kapaslangan” (Clean Conscience) is one of the three finalists from Asia/Oceania Division. The song’s composer is Bro. Boy Gan and was performed by Bro. Nestor Torres. Vietnam’s “Nais Kong Awitan Ka” (I Want to Sing To You) composed by Sis. Marjorie Navarro and interpreted by Sis. Maricel Ciricaco. Last to be presented from the division is “Sa Puso Ko” (In My Heart) by Bro.Jude Abarca from Singapore, and performed by Bro. Gino Mendoza. “Ang Aral Mo Ama” (Your Teachings Oh Lord), composed by Sis. Joana Fortaleza and Sis. Roschelle Tantay and “In You My Lord,” composed by Bro. Bernardo Flores, are entries from Dubai-UAE Division. Sis. Erlyn Dondriano interpreted “Ang Aral Mo Ama” while Bro. Rigor Arellano sung “In You, My Lord”. Completing all 13 finalists are entries from Europe/Israel/Africa, South and North America, respectively. Randy Mangiliman’s composition, “Mapagmahal na Dios” (Loving God” represented Europe/Israel/Africa in the songwriting tilt and was interpreted by Sis Dalyn Concepcion. Brazil’s entries include “Hanggang sa Walang Hanggan” (Until Forever), written by Sis. Loida Dumandan and performed by Bro. Mark Libradilla; as well as “Dakila Kang Manlalalang” (You Are The Great Creator), written by Sis. Fe Sunga, sung by Sis. Jelisa Trangia, made up two of South America’s winning pieces. East Coast, North America was represented by Bro. Aaron Romero’s entry, “Merciful God”, which Sis. Myka Cloma performed during the finals night. 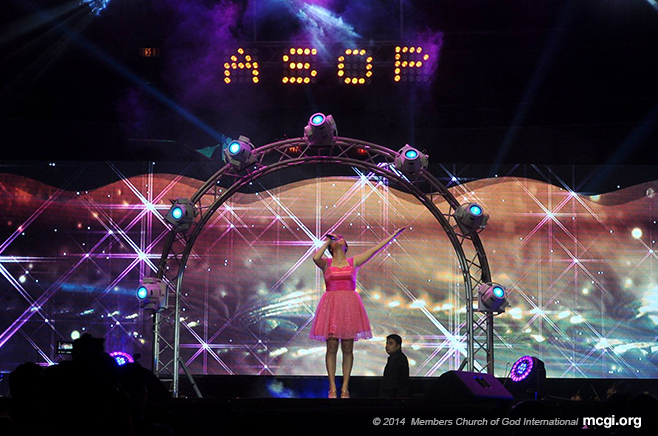 ASOP Music Festival entered mainstream television to discover local and international praise song writers. 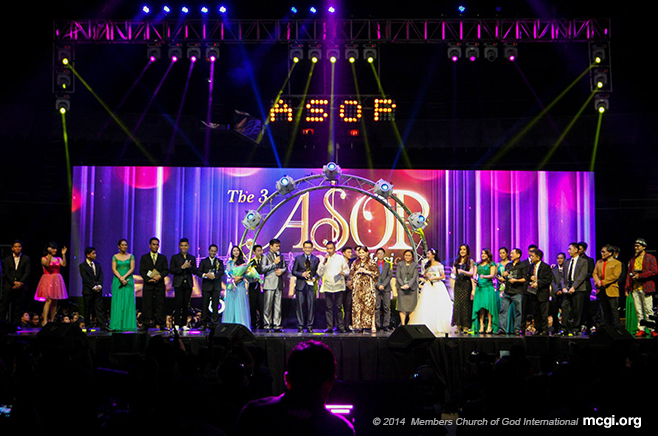 ASOP TV, featuring a weekly and monthly elimination rounds, airs every Sunday on UNTV 37. 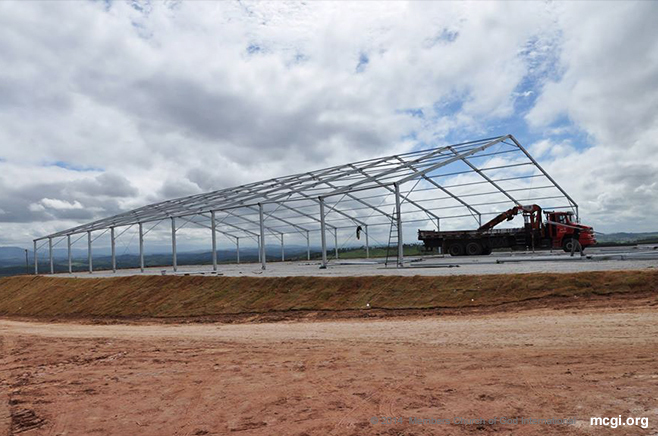 Come April 5-7, 2014, the Members Church of God International (MCGI) will not only see in South America host its International Thanksgiving to God (ITG) for the first time, but hear new songs of praise as well. The bi-annual A Song of Praise (ASOP) Finals is usually done a day after MCGI’s quarterly thanksgiving. This time around, the songwriting festival will coincide with the three-day ITG event as members worldwide gather in ADD Convention Centers connected via Internet and satellite. During the last ASOP Finals in 2013, the dates of the Year-End Finals this April is shown on a big led screen at the ADD Convention Center. ASOP song entries from different countries are to be presented during breaks of the ITG or “Pasalamat ng Katawan” (Thanksgiving of the Body), which will start at 5 p.m. in the Philippines and 6 a.m. in South America. 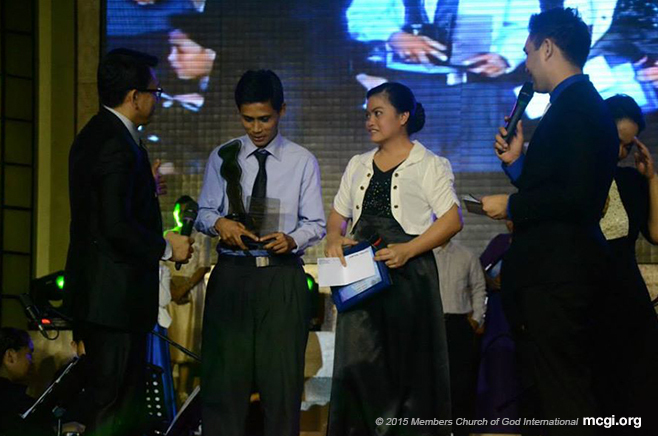 The ASOP Year-End Finals and the ITG are a few days shy of MCGI’s celebration of the Christian New Year. MCGI follows the Hebrew calendar observed by the Lord Jesus Christ and the Apostles. The religious group welcomed the first of Nisan Year 5774 at sunset of March 31, 2014. The ASOP Music Festival is MCGI’s songwriting festival that started in 2004 that encourages members to write original, perfect songs of praise to God. It branched out on television as a weekly program being aired by UNTV television channel. Apart from the ITG and ASOP Finals, it is also Bro. Eliseo Soriano’s 50th Year celebration of service to God and humanity. 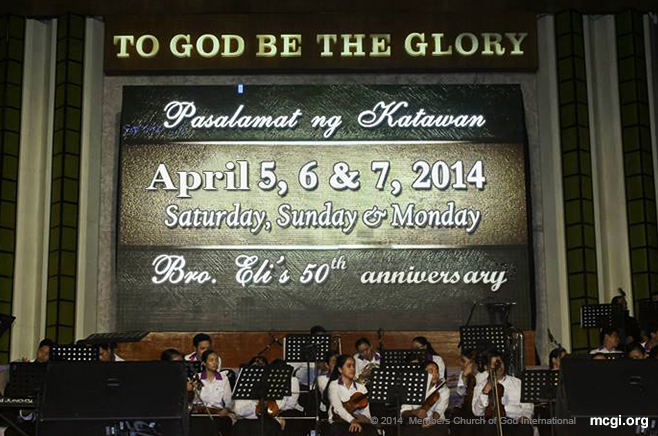 The MCGI Presiding Minister will reach his 50th spiritual birthday on April 7. Bro. 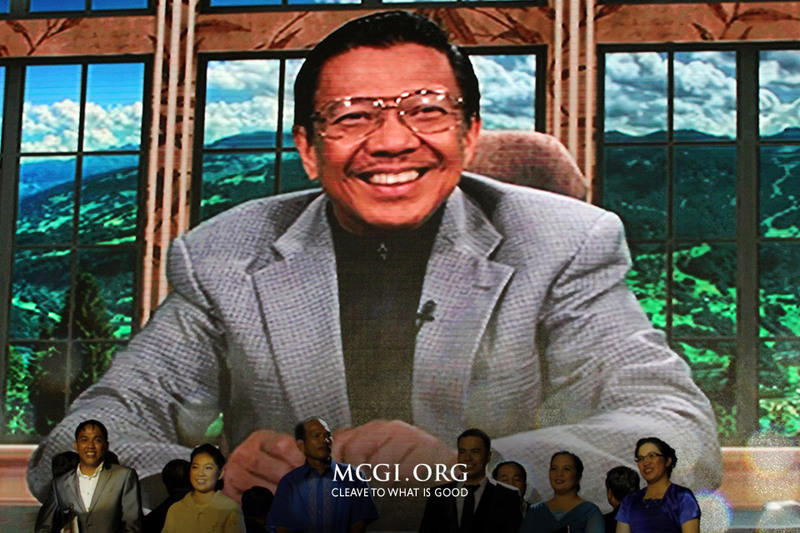 Eli is the host of the Philippines’ longest-running religious program, Ang Dating Daan (The Old Path). Both the program and Bro. Eli have won multiple accolades throughout the years. Recently, the Dangal ng Bayan Awards gave Bro. Eli Soriano the Best Bible-Based Television Evangelist title. For the special event, delegates from the Philippines to London to the USA and Canada are flocking to the newly-built convention center in South America. As MCGI Leaders Bro. Eli and Bro. Daniel Razon remarked in a recent Thanksgiving service, it is the fulfillment of the prophecy written in Zech. 8:20-21 where servants of God from different countries go to one place to seek the Lord of Hosts. 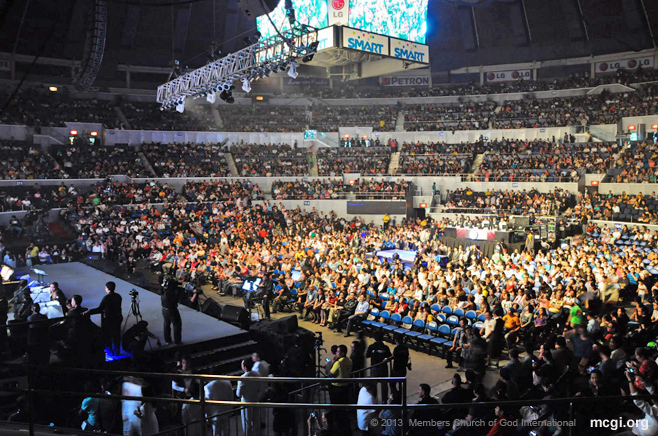 The Big Dome or Smart-Araneta Coliseum, considered as one of the largest multi-purpose coliseums in Asia, was filled to the brim by thousands of observers enthusiastic to witness the A Song of Praise Music Festival Grand Finals Night. A big crowd come together for the A Song of Praise (ASOP) TV Music Festival Year 2 at the Smart-Araneta Coliseum on September 9, putting behind differences in faith to celebrate songs of praise dedicated to God. Through live streaming, Bro. 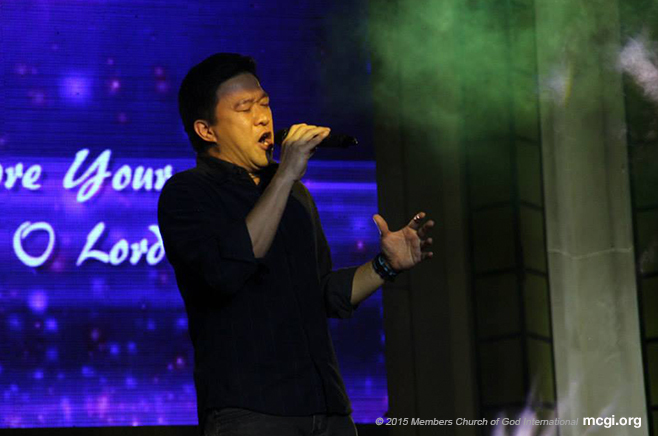 Eli Soriano explains before the crowd the history and aim of ASOP TV, which is a counterpart of the songwriting competition with the same title, albeit an exclusive affair inside the Members Church of God International (MCGI) since 2004. Bro. Eli Soriano, Presiding Minister to MCGI, recalls how he and Bro Daniel Razon, the Vice-Presiding Minister, started ASOP initially inside MCGI as a way of encouraging amateur and professional composers and lyricists to create songs of praise to God. “God is well-pleased tonight because despite our differences in faith, we came together for an occasion that celebrates songs of praises dedicated to Him,” shares Bro. Soriano. Twelve new compositions of diverse genres were presented this year. 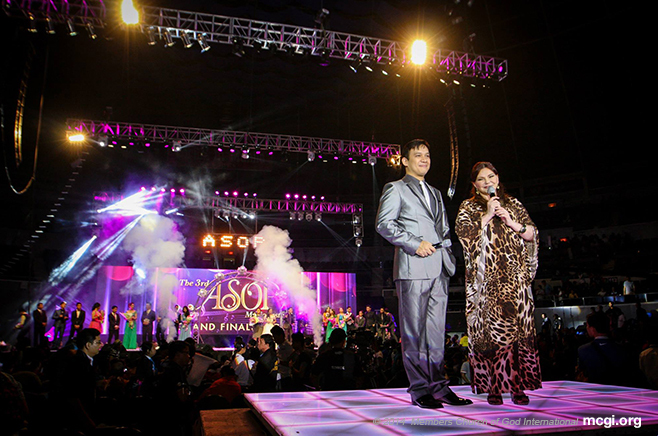 It was in 2011 when ASOP TV was launched and aired by UNTV, but it was already regarded as the first major show of its kind, the grandest, and the most generous in giving prizes. Bro. Eli says that another factor that sets ASOP TV apart from other songwriting contest is the prizes. By giving away bigger prizes, more people will be encouraged to join the contest while the winning composers will then be motivated to focus in composing more praise songs. The song “Ikaw” penned by Boy Chirstopher Ramos Jr. emerged as the “Song of the Year” while its performer, Pop Pinoy Superstar champion Jonalyn Viray was hailed as the Best Interpreter. Ramos received P500,000 while Viray took home P50,000. The list of runners up include “I am Grateful”, “Lagi Kang Nariyan”, and “You’ll See Miracles” composed by RJ Jimenez, Christian Obar, and Paul Hildawa, respectively. 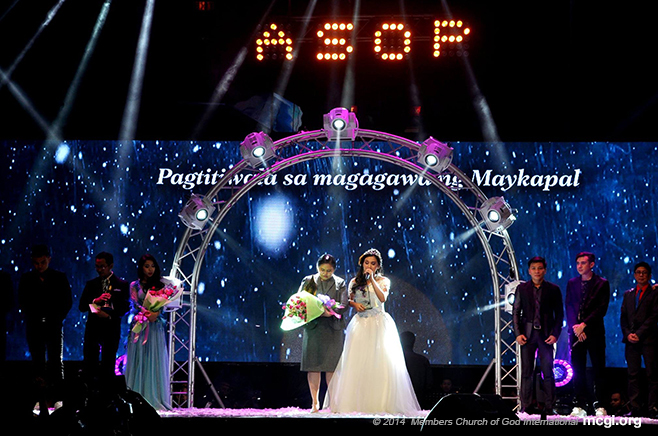 “Ikaw” (You) crafted by Boy Christopher Ramos Jr. and interpreted by Jonalyn Viray won the Song of the Year title in the ASOP Grand Finals Night at the Big Dome on September 9, 2013. Comedian and TV host Joey De Leon served as one of the board of judges together with Mon del Rosario, a well-known hitmaker and ASOP TV’s resident judge; Annabelle Regalado-Borja, E-TALent Management and Entertainment’s CEO; and Kathleen Dy-Go, Universal Records’ General Manager. Audie Gemora, an accomplished stage actor and director; Snaffu Rigor, a highly acclaimed composer and singer; and Raul Sunico, the Cultural Center of the Philippines’ incumbent President, complete the board. Finalists and judges praise Bro. Eli and Kuya Daniel for innovating a show that can make people thankful and bring them closer to God through music. Winners pose for photos after the awarding ceremony of the ASOP Luzon Region Finals last June 9, 2013. Pampanga Division and North 1 Division bested eight other entries from Luzon Region and officialy entered the finalists slate for the upcoming A Song of Praise (ASOP) Mid-Year Festival come July 8, 2013. “Alay Sa’yo,” (For You), Pampanga’s song entry, was composed and interpreted by Sis. Dalisay Painaga. Meanwhile, “Salamat sa Pagkakataong Umiral” (Thanks for the Opportunity to Exist) from the North 1 Division was written by Bro. Ronald Morales. Luzon Region held its ASOP finals last June 9, 2013. 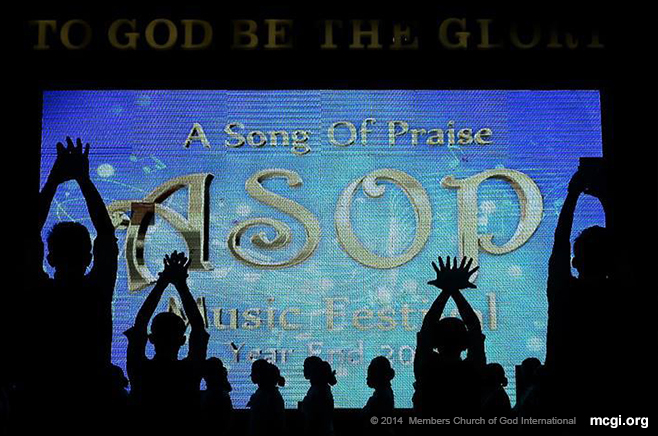 The ASOP Music Festival is a bi-annual songwriting event of the Members Church of God International (MCGI). Church Leaders Bro. Eli Soriano and Bro. Daniel Razon started the songwriting fest in 2004 with the vision to hear the best “Church-grown” songs of praise for the Lord. Regional finals are being held all across the globe to hear and pick song entries for the mid-year and year-end finals of the ASOP Songwriting Festival. Ministry helpers serve as judges during such elimination rounds. The Mid-Year finals will happen right after the International Thanksgiving of the whole Church from July 5-7, 2013.